Yesterday I posted a cute sewing girl image from an antique ladies magazine. The one you see here is the sister image, so to speak, and shows a young woman with a dress form and a pattern. I wanted to make sure I posted it today, before I forget… or loose it in one of my piles of paper!! I think the 2 of them would be cute displayed together, maybe on a little wood plaque or a wooden box in a sewing room! Antique Hobnail Light Image! Vintage Baby Bonnet Image! Vintage Winter Birds Image! Fabulous image! Thank you, Karen. Thank you Karen for sharing your fabulous images with the world. Your posts always put a smile of my face! Thank you for all of your hard work (and your blog)! I like this image. I have already made a card in my mind with it!! 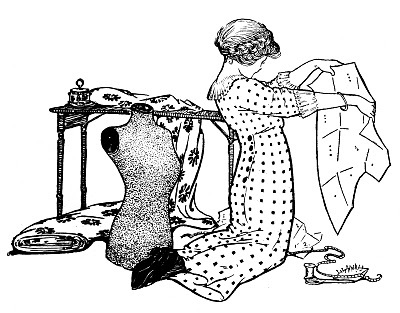 Karen: I adore these vintage sewing images! Thank you so much for answering my request! You’re welcome! I’m glad you got to see this other one too!! Oh my gosh, you are simple amazing! Thanks you so much! Oh my gosh, you are simply amazing. Thanks you for the wonderful clip art! Thank you for letting us have a copy of this. I have never seen it, but I absolutely love it. You are such a generous person. Hi, we have a small facebook group dedicated to sewing and were wondering about the copyrights of this image. Could it be possible to use it for non commercial purposes, like printing group member shirts etc?